Cape Town - Quinton de Kock and Imran Tahir, both members of the Highveld Lions franchise, on Tuesday were found guilty of level 2 breaches of the Cricket South Africa (CSA) Code of Conduct and have each been suspended for one Sunfoil Series match without the need for an additional fine. Both players pleaded guilty to the offences so there was no need for a hearing. "I find Mr De Kock guilty of a breach of clause 6.3.1 (c) and (f) of the Code of Conduct in that he inappropriately and deliberately had physical contact with a player in the course of play; and used language that is seriously obscene, offensive or insulting towards another participant. "I take into account the fact that Mr De Kock has not sought to evade responsibility for his conduct, that he had admitted the offence and has accepted that his behaviour was incorrect and that he failed to play the sport in the spirit of the game." 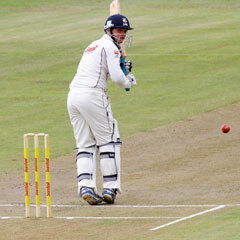 De Kock further apologised to umpires Shaun George and Brian Jerling for his behaviour. "Having taken all factors into account, it is important that an effective penalty be imposed and that it is fundamentally important for disciplinary action to correct behaviour. In the circumstances I am satisfied that the appropriate penalty in respect of this offence, which is a level 2 offence, is a suspension for one four-day match but without the need, in addition, to impose a fine," Cloete said. 1. De Kock is ineligible for selection for the forthcoming Sunfoil Series match against the Knights due to be played from Jan 31 - Feb 3, at De Beers Diamond Oval, Kimberley. "I find Imran Tahir guilty of a breach of clause 6.3.1 (f) of the Code of Conduct in that he used language that is seriously obscene, offensive or insulting towards another participant or a spectator. "I take into account the fact that Mr Tahir has not sought to evade responsibility for his conduct, that he had admitted the offence and offered his sincere apology in writing. "Having taken all factors into account, it is important that an effective penalty be imposed. In the circumstances I am satisfied that the appropriate penalty in respect of this offence, which is a level 2 offence, is a suspension for one four-day match but without the need, in addition, to impose a fine." 1. Tahir is ineligible for selection for the forthcoming Sunfoil Series match against the Titans due to be played from Jan 24 - 27, Willowmoore Park, Benoni.